'A Shocking Development' In The Long Struggle To Hold On To Kunduz : Parallels The U.S. and NATO have spent years in Kunduz, Afghanistan, building communities to keep insurgents out. Two who were there 12 years ago describe how it felt this week when the Taliban retook the city. Smoke rises from Kunduz, Afghanistan on Thursday. 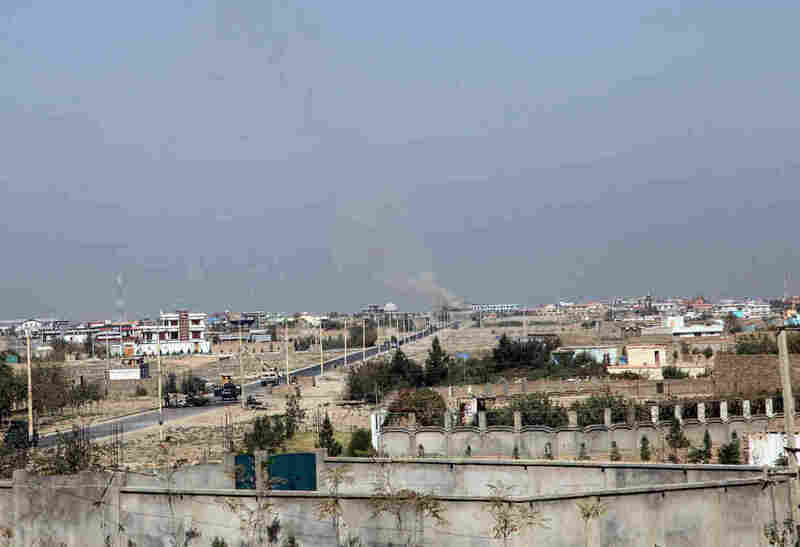 Government forces have reportedly retaken the city after it was seized by the Taliban on Monday. Taliban forces stormed the Afghan city of Kunduz on Monday; after several days of fighting, Afghan forces claimed to have retaken the city. But fighting continued, and on Saturday, a U.S.-led airstrike appears to have struck and badly damaged a Doctors Without Borders hospital, killing doctors, staff members and patients. The week of violence has put the city back in the headlines. But the region's struggles aren't new. Over the past 12 years, the U.S. and NATO spent hundreds of millions of dollars in Kunduz province alone building up infrastructure, all in an effort to keep insurgents out. After U.S. combat forces left the country last year, Afghan national security forces were expected to take over the fight against insurgent groups still posing a threat. But now that stability is threatened. This week on For The Record: The fight to keep Kunduz. We hear from two people who were there 12 years ago and worked to stabilize the city, and who were then optimistic about the city's future. Fourteen years ago this week, U.S. forces launched air strikes in Afghanistan. Afghans like Matin Sarfraz, who was 16 at the time, grew hopeful that the Taliban would soon be defeated. "My father was telling us that, 'Hey guys, you'll have schools, you'll have work, you will have a better future,' " he says. "The international community came to Afghanistan. We'll have a proper government you know? We'll have no fighting." Sarfraz's family had good reason to be optimistic: After the Taliban fell, international aid started flowing in. The U.S.-led NATO mission set up a network of bases around the country called Provincial Reconstruction Teams, or PRTs. The Americans set up the PRT in Kunduz in 2003 and the Germans took over shortly thereafter. The teams, made up of international forces, civilian aid workers and development experts, created a lot of jobs for the young Afghan generation. Ackermann says the northern region was relatively stable when he arrived to lead the PRT. "We were very much in the civilian mode when we came and tried to really set up ... better working institutions, [a] better working education system," he says. 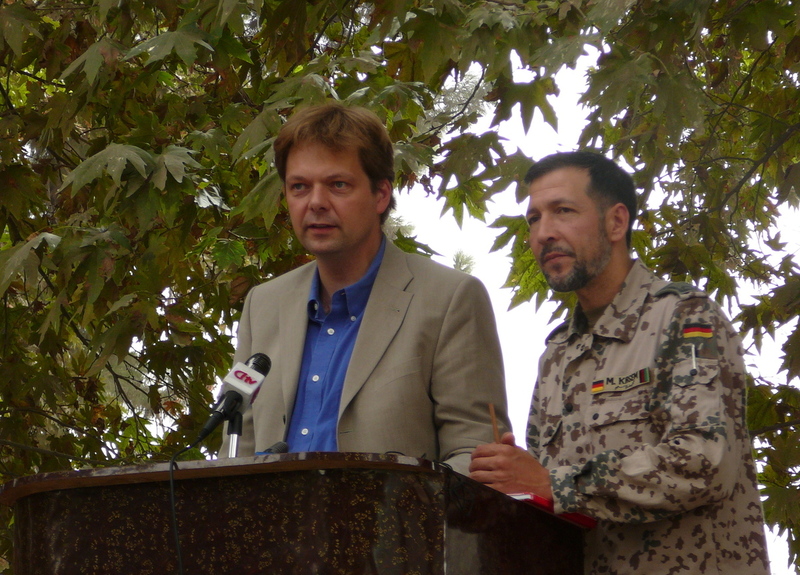 German official Philipp Ackermann gives a speech with military translator Mohamed Oda in 2006, while heading the Provincial Reconstruction Team. They built schools, government buildings, water and sanitation systems and health clinics. They even set up a radio station, where Sarfraz secured a job as a freelance reporter. It was a point of pride for both him and his family. "Everyone was so happy to work with the internationals," Sarfraz says. While the east and the south of Afghanistan were active war zones, the north and Kunduz were relatively safe. The Taliban felt far away — until it wasn't. Ackermann says when the PRT needed supplies, the staff went to the local bazaars. In May of 2007, three German soldiers were killed in an attack at a Kunduz bazaar after going in to buy a fridge. "That was by far the saddest moment in my career in Kunduz," he says of the attack. "That changed, of course, our regime to a certain extent. We were much more worried and concerned, and it changed a bit the mood of the population." As extremists made their way to the province from other parts of Afghanistan and Pakistan, Ackermann started to realize infrastructure alone couldn't keep Kunduz safe. "We felt that when we improved on the development side, the security side would improve, and the other way around," he says. But in reality, the opposite was true. "If security is there, you can improve on the development, but you can't try to get security through development projects. That was a lesson we learned in spring 2007." After the attack in the Kunduz bazaar, German forces didn't go out into the local communities as often. NGOs began pulling back, and international development projects were harder to get off the ground. Ackermann's tour of duty was up a few months after the attack. But Sarfraz didn't have the choice to leave. Instead, he did everything he could to make a better life for his family, despite the changes in Kunduz. He studied hard, getting a master's degree and eventually a job with the Afghan government in Kabul. But Kunduz is still Sarfraz's home; his wife and kids still live there and he goes back often. In fact, he was in the province early Monday when Taliban forces made their advance. "At 3 o'clock in the morning, I heard a very loud explosion, then a gunfire, so I woke up and my kids woke up and they were crying," he says. "Then another explosion happened and another happened." The next day his family hunkered down in their house while the fighting continued. Sarfraz finally made it back to Kabul for work, but his wife and children are still in Kunduz — and he's afraid for them. Both Sarfraz and Ackermann believed that Kunduz was exceptional — that this place, high up in the northern mountains of Afghanistan, would somehow remain insulated from the violence in other parts of the country. "It's a shocking development," Ackermann says, "because it's the first time that the Taliban really conquer a bigger city in Afghanistan, albeit only for two days, but it's really a new scale. I am pretty sure that the Taliban are not in a position really to hold centers like this for a long time, but we have to acknowledge that they are very present and they have a very good strategy, apparently, and that's frustrating." It is hard for Sarfraz to process what's happened to his city — all the work over the past decade to build a stable Kunduz could be destroyed by the Taliban in just a few days. "I can't imagine if my city is back to that time when Taliban was in power in that city," he says. Sarfraz is desperately trying to find a way back to Kunduz to make sure his family is safe. * We asked Phillip Ackerman how he thinks about the work that he and so many other Germans and Americans, civilians and military, did in Kunduz over the past 12 years. The schools, the clinics; if those projects don't last, if Kunduz is made unstable by Taliban insurgents, does it mean his work was in vain? He paused and told me, 'That's a very personal question.' He pivoted quickly and talked about the need for an ongoing international presence in Afghanistan, but it was clear that he is having trouble reconciling all the money spent and lives lost with the reality in Kunduz right now. * I happened to have been in Afghanistan in 2004 when Doctors Without Borders (MSF) made the announcement that the organization was pulling out after five of their staff were killed by insurgents. MSF had been working in Afghanistan for 24 years and prided itself on continuing to work in the country through years of civil war and violence. The 2004 attack changed things for the organization, and its leaders didn't think they could afford to put their staff at risk. It took five years for MSF to return to Afghanistan. The bombing this weekend of the MSF clinic in Kunduz killed 12 staff members — three times the number of staff killed in that 2004 attack. It's unclear whether this tragedy will again push MSF out of Afghanistan. * The U.S. combat mission in Afghanistan ended in 2014. U.S. flags were lowered; there was a ceremony. But on Saturday, the Pentagon released the names of six airmen killed Friday when a C130 military plane crashed in Afghanistan. The Secretary of Defense is now calling for an investigation into the bombing of the MSF clinic that killed 19 people. The official combat mission may be over but the war in Afghanistan is not. Click on the audio link above to hear the full conversation.